Welcome to the Beautiful Feet community! Congratulations on your acceptance to Beautiful Feet Boot Camp. We are excited that you will be joining us here in Oklahoma for two months as we work together to prepare you for your time overseas. It is truly an honor to be able to play a role in your following Jesus to the unreached. As you read through this information, please be aware of the various activities and deadlines in which you will engage in preparing for Boot Camp. We are committed to providing the best training possible. Know that we have been and will continue to pray for you as you prepare to arrive. If you have any questions please contact one of us. If not, we’ll see you soon! Your training begins now, as you begin to accomplish a few things before you arrive. Purchase a Kindle if you do not already own one (or other dedicated reading device for e-books and PDFs). 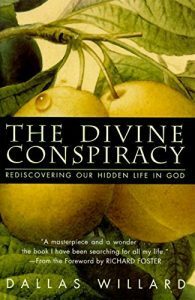 Purchase and read: “The Divine Conspiracy: Rediscovering our Hidden Life in God” by Dallas Willard. This book is 400+ pages long. It is not an easy read, so begin as soon as possible! 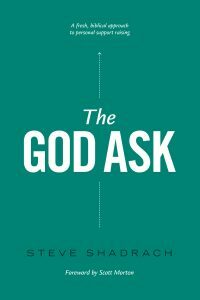 Purchase and read: “The God Ask” by Steve Shadrach. Bring this with you to Boot Camp. This is the foundation we will build on for helping you develop a solid support base. Downsize! Increase your ability to live a more nomadic lifestyle. The God Ask by Steve Shadrach. Foreword by Scott Morton. "A fresh, biblical approach to personal support training"
Your schedule will be full—there will not be room for outside work or time off during this eight weeks of intensive preparation. It is crucial that you give this time your full attention so that you may focus on God, personal growth, instruction, community and service. The purpose of the four months which lie between successful completion of Beautiful Feet Boot Camp and deployment overseas is to finalize your funding/team-building, moving plans and paperwork as well as begin the first online classes of your two-year contextual apprenticeship. Everyone’s exact departure dates will vary, but the target is four to six months following graduation. Necessary medications and documentation for any existing health issues of which we need to be made aware. An attitude of mutual love and submission to God and each other. As a student of Beautiful Feet Boot Camp, you will be living on campus for the two-month duration of training, participating in a daily rhythm of prayer, work and rest. Single Boot Camp students may share a room with other students of the same gender—up to five per room. Married students will have private rooms. Each room is furnished with beds, bathroom, sink, mini fridge and microwave. Towels and linens are provided. The walls between rooms are thin, so it will take a little conscious effort to respect the privacy of your neighbors. There is a common “living room” space available to read, talk, watch TV, etc. and a large dining area. Our playground and treehouse is a favorite place for many! Food storage, cookware and supplies are available to you in our community kitchen. Since this is a shared space, please be considerate of others as you prepare, eat and clean up from your meals. Students will be responsible for purchasing their own food—this is not included in the housing fee. Most of us didn’t go into frontier missions because we always wanted to be a fundraiser. But the two have a long history and it’s okay. It’s good for us to have to rely on others, to learn to effectively communicate our passion and recurit others to join us! This is really a discipleship opportunity! As a missionary living on donated funds, we have the privilege of raising up people around us to understand and activiely participate in the Great Commission—an opportunity to share God’s heart for the world and recruit a team to participate with us in this eternal endeavor. It is our desire that you are able to couple a God-centric mindset along with some basic, practical tools to help you in building, maintaining and growing a partnership with your support team. Make every effort to get together with your home church and your friends and family in order to establish the foundation of support you will need as a missionary. Let your Beautiful Feet contact person know if your church will be hosting a send-off for you before you leave for Boot Camp. Come to Boot Camp with a list of names and contact info of your support network. Beautiful Feet will provide you with more support raising training during and after your time in Boot Camp, for you to refine your support raising strategy and fill out your support team with people who can pray for you, provide money for your needs, assist you with communication and other practical helps. Important things you and your donors need to know! We work hard to respect the preferences of each donor’s gift. By federal tax laws related to 501(c)(3) organizations, in order to ensure the deductibility of contributions, all gifts must be given with the understanding that Beautiful Feet has complete control and administration over the use of the donated funds. That being said, we have always made it our intention and practice to give 100% of each gift to the missionary or project to which it was designated by the donor. Many other sending organizations charge an admin fee, taking anywhere from 5-25% of each donation. Beautiful Feet does not take a percentage off the top of your donations. As a Beautiful Feet missionary, you have the opportunity to determine for yourself how much of your support you would like to donate to the Beautiful Feet general fund to help us pay our bills and provide services to you, our missionaries, and to future missionaries as we encourage them into service. Our home staff all live on support just like you and do not receive a salary from Beautiful Feet. Upon acceptance into Beautiful Feet Boot Camp, we set up your gift account. When a donor makes a gift to Beautiful Feet and designates your account number and name, we earmark those funds to go to you for your ministry. No funds will be disbursed until you actually arrive at Boot Camp. Download this handy little checklist to help make sure you’ve got things covered!